The “Blockbusters Anytime” philosophy comes to April, as the Easter weekend brings another installment from one of the most unlikely mega-franchises of all time. Furious 7 is the latest entry in the car-racing/heist/whatever the hell they want it to be series, which has had one of the strangest trajectories in cinema history. Starting out as a note-for-note Point Break rip-off, but with cars instead of surfboards, it dropped heavily through its first two modestly genre-hopping sequels, surviving mostly on international success. Then Vin “Human Subwoofer” Diesel decided he needed a return to basics after his non-action career didn't really work out, and things jumped into ridiculousness. The $71 million opening of Fast & Furious turned heads and secured funding and new actors for the series, which busily set out retconning its various threads into one semi-coherent mythos, all surrounded by driving cars really fast into things. One half expected them to start using cars to perform open-heart surgery. 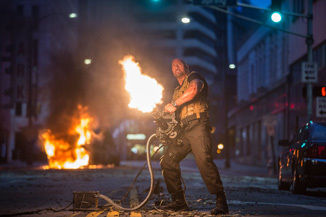 The addition of Dwayne Johnson in the fifth film took things to a heretofore unknown level, both in action and box office, and was the first in the series to top $200 million domestic. Arriving at the right time for the explosion in international box office, it ended up over $600 million in final proceeds. The sixth film basically left reality behind in its plotting, and showed that its up-leveling was not yet complete, hitting nearly $800 million internationally. The seventh entry however, is tinged by a sense of tribute and melancholy thanks to the tragic (and, let's face it, preventable) death of Paul Walker in a car crash during filming, but not on the set of the film. After some time to regroup, since this appears to be a cast that is legitimately close, filming was continued with a mix of body doubles (including Walker's brothers) and some CGI to give Walker an appropriate sendoff. The film itself has raised its stakes to ridiculous heights, becoming something like a latter-day Die Hard movie mixed with Ocean's Eleven, if Clooney and Pitt tried to rob a casino with a muscle car. Ballooning the cast yet again, it adds Jason Statham as the big bad, the brother of the kingpin the gang dispatched in the last film, who starts coming after them for revenge. And *then* Kurt Russell's character, another new addition, sides with Diesel and company to protect them if they do some elaborate job for him and things go really out of control and suddenly someone's jumping a sports car from one skyscraper to another.